At Father Joe’s Villages, our staff, volunteers and supporters work to make Christmas special for our neighbors in need. Together we create the best possible Christmas for children living with us. Here are some of the events that make our children feel at home for the holidays. Homelessness creates stress and chaos in the lives of families, disrupting normal family traditions. Often, there is little energy and money for Christmas. At Father Joe’s Villages, we take care of the basic needs, including food, shelter and childcare, so that parents can focus on getting back on their feet. We also partner with incredible donors, groups and volunteers to create the best possible Christmas for children living in our shelter. Santa and Mrs. Claus visited all the way from the north pole to give presents to each child in our Therapeutic Childcare Program. In the morning, children five and under took turns unwrapping gifts specially picked out for them and funded by Old Town Trolley Tours. Then, in the afternoon, school-age children were treated to a Christmas Party at Old Town Trolley’s headquarters, complete with pizza, piñatas, individualized gifts and a private trolley ride across San Diego. This enchanting experience is made possible by the generous team at Old Town Trolley, who have been working to create Christmas magic for our children for more than 10 years. Every year, our dedicated Ladies Guild members come together to fund gift giving and present wrapping for our children. 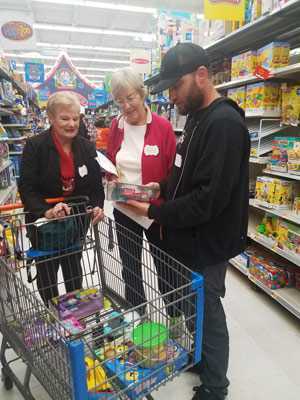 On two days in December, Ladies Guild members and parents came together at Walmart to shop for gifts. Parents received $75 per child and shopped side by side with a Ladies Guild member picking gifts in the hour before the store opened. This shopping trip allows parents to pick out the perfect gifts for their kids and have a hand in creating Christmas magic. After shopping, the Ladies Guild and parents come together to wrap the gifts and get them ready for Christmas morning. We thank Walmart for hosting us and for their sponsorship throughout the year and Father Joe’s Villages’ Ladies Guild for their year-long efforts to fund and plan this wondrous event! Every year, nearly school-age children are given VIP treatment at the Old Globe Theater’s production of How the Grinch Stole Christmas. The children spend a day at the theater with the Grinch himself. They are invited backstage to see the inner-workings of the production and meet the cast. Thank you to the Old Globe Theater’s cast and crew for providing this unique holiday experience. Why is the annual Children’s Christmas Party so extraordinary? Because, every year for over 20 years, our children have a once-in-a-lifetime experience. Not only do they ride in a limousine o a special party just for them, the ride is also flocked by a motorcade of Harley Davidsons, ridden by the Harley Davidson Club of San Diego. 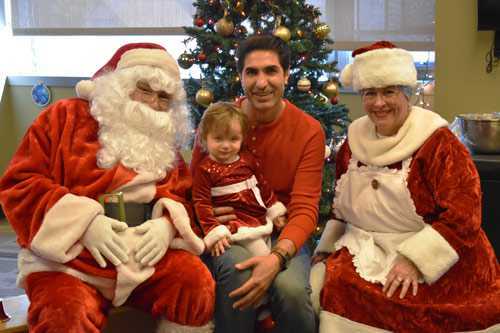 This fun-filled holiday party for nearly 100 children is hosted at the Doubletree by Hilton Hotel and includes face-painting, food, gifts and a special appearance from Santa Claus. Proceeds from the event will support “Angel Funds,” which cover the needs of children and teens in school and extracurricular activities, including athletics, the arts or clubs. The cost of school dances, athletic uniforms, field trips, college applications and more are above and beyond what these children and teens can afford. Thank you to the many incredible partners who make this event possible: Event leader Jim Delapa, and supporters Merrill Lynch, San Diego software company Kiran Analytics, the University of Dayton Alumni Association, the San Diego Harley Owners Group, the DoubleTree by Hilton in downtown San Diego and EPIC Limousines.